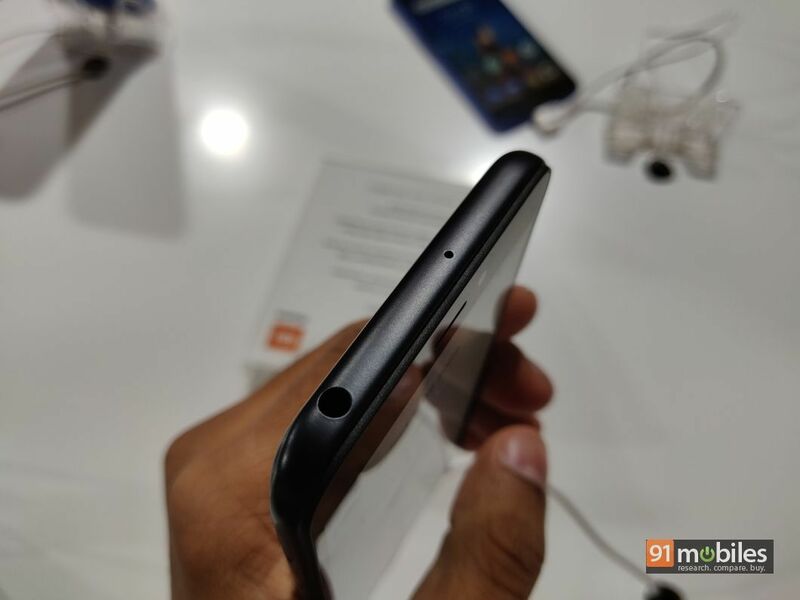 Home Bottom panel Xiaomi Redmi Go first impressions: can it disrupt the entry-level segment? 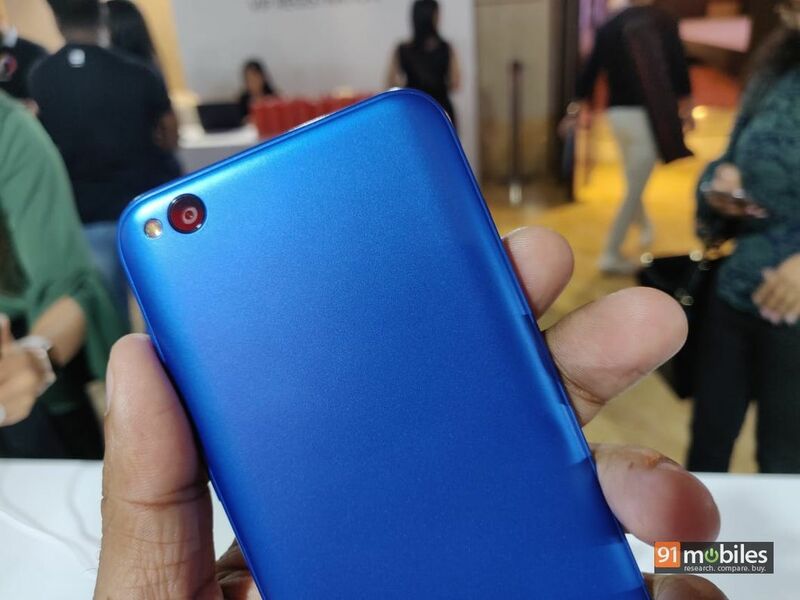 Xiaomi Redmi Go first impressions: can it disrupt the entry-level segment? As per a IDC’s report for India’s phone market in Q4 2018, 56 percent of mobile users in India still use a feature phone. That’s a staggering statistic, and is partly why the country is touted as the biggest smartphone market in the world – there’s so much room to grow. That said, most feature phone users can’t take the plunge and buy mid-range or flagship devices straight away. 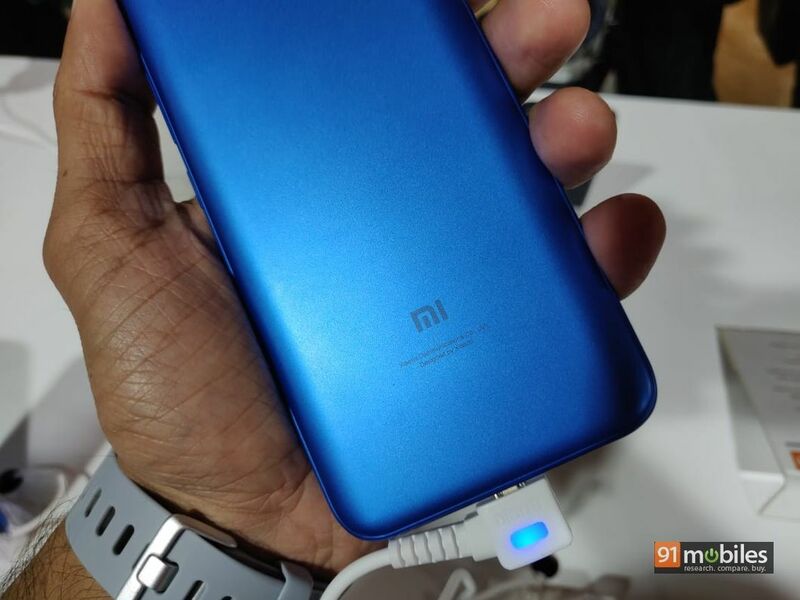 Therefore, in an attempt to ease their way into the world of smartphones, Xiaomi recently announced the Redmi Go in India, a wallet-friendly handset that also happens to be the brand’s first offering to ship with Google’s Android Go software. At the launch event in Delhi, I managed to get my hands on a unit and here are my first impressions of the same. 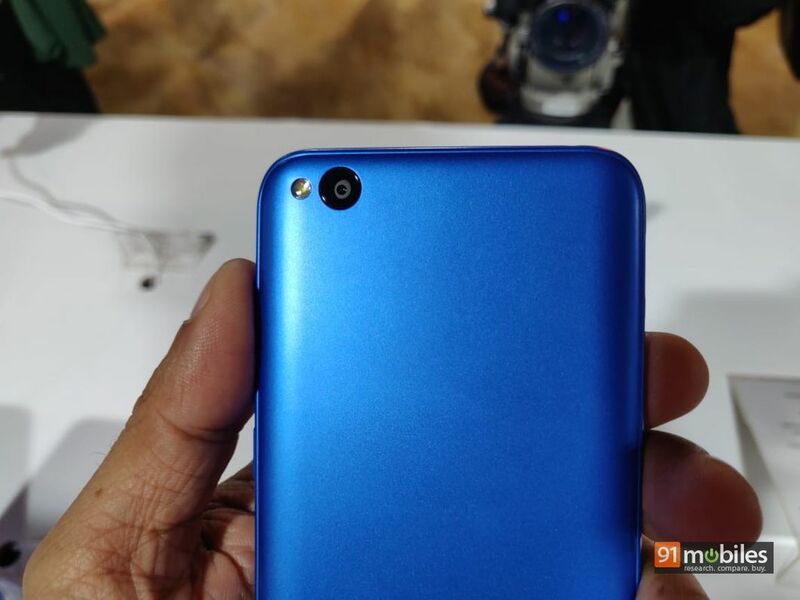 The Xiaomi Redmi Go draws parallels to its predecessor, the Redmi 5A (review), in the design department. 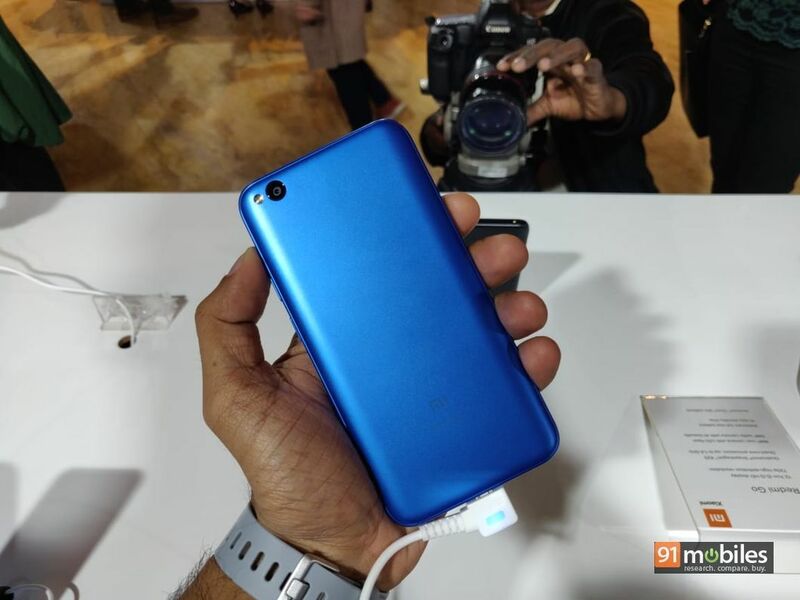 However, this time around, the company is also offering the device in an all-new Blue hue, which looks fantastic. 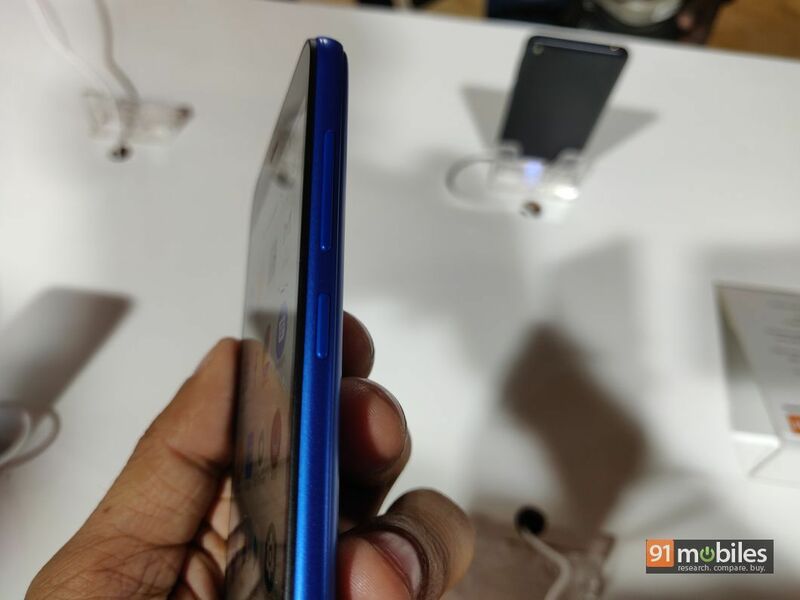 It’s just the right amount of flashy and since the company has opted for a matte finish towards the back, the device doesn’t come across as tacky either. That said, buyers loWoking for a subtler hue can pick up the smartphone with an all-black paint job too. 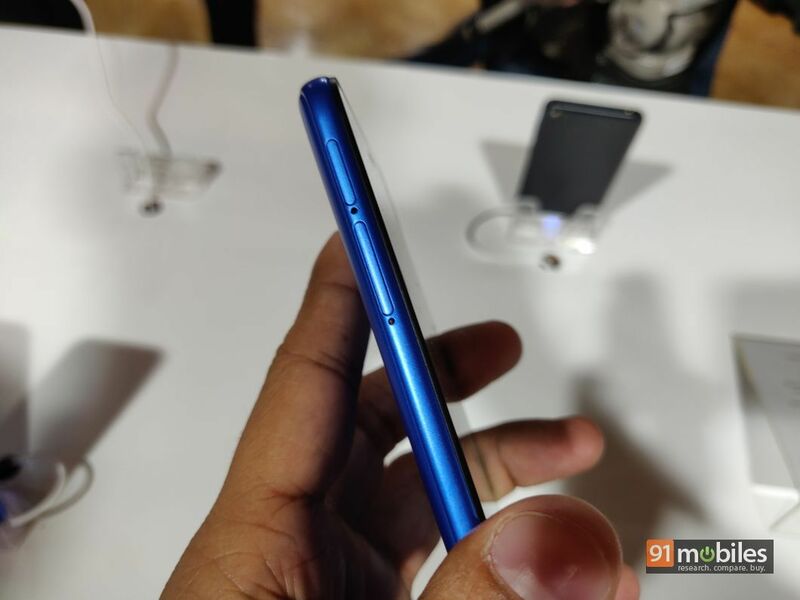 As for the rest of the design, the Redmi Go features gentle curves towards the back and rounded corners along the edges which don’t just look good but also lend the handset an excellent in-hand feel. Moreover, thanks to the smartphone’s compact footprint, I could use the device comfortably with just one hand. What’s more, while the smartphone has been constructed in entirety using polycarbonate, it doesn’t feel cheap or flimsy. In fact, the back panel felt exceptionally robust and there were no instances of flexing in or around the frame of the device either. 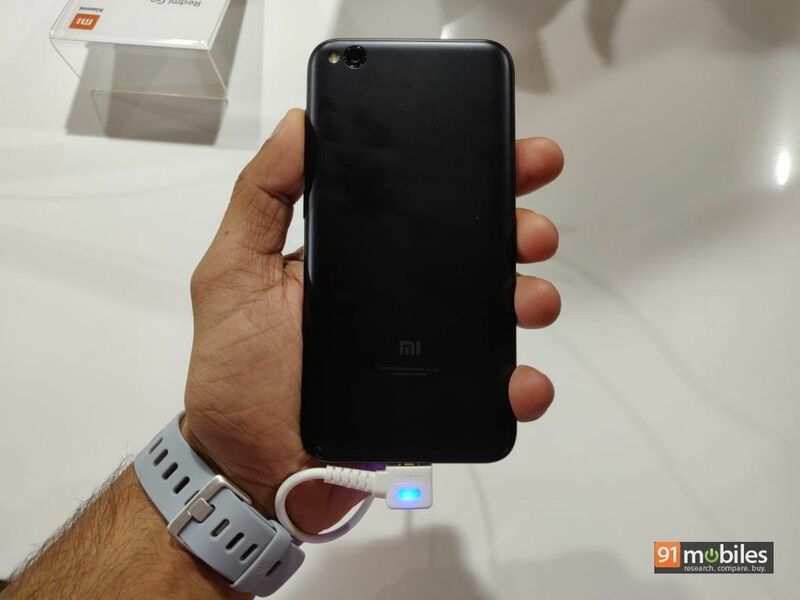 For ports and buttons, the Redmi Go features a hybrid SIM slot placed towards the the left-hand fascia. The right-hand spine of the device houses the volume rocker and the power button. Towards the bottom, the smartphone features a micro=USB port for charging, a speaker grille, and a microphone. Up top, the device comes with a secondary microphone which reduces ambient noise during phone calls and a 3.5mm headphone interface. Unfortunately – and I know this is asking too much – but I really hoped to see a fingerprint sensor on the device. Display-wise, the Xiaomi Redmi Go ships with a 5-inch HD panel with a 16:9 aspect ratio. The quality of the panel felt adequate during my brief stint with the device and the screen exhibited bright colours with decent viewing angles. There was a noticeable blue shift when I tilted the display and viewed it from an angle, but considering the smartphone’s price point, I’m willing to let this slide. 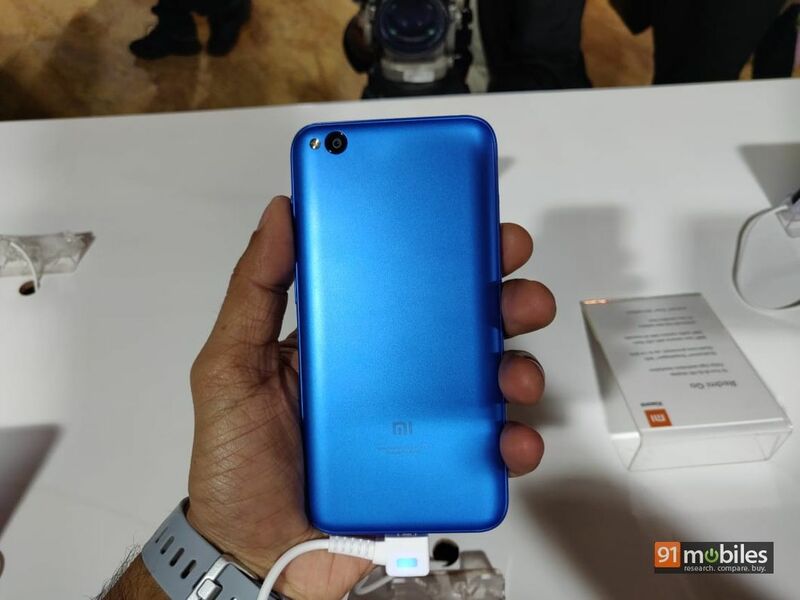 The core specs of the Redmi Go smartphone include a quad-core Qualcomm Snapdragon 425 processor which has been paired with 1GB of RAM and 8GB of internal storage. For those cribbing about the limited storage space on the device – the Redmi Go gives buyers the option to expand the storage up to 128GB by means of a microSD card. 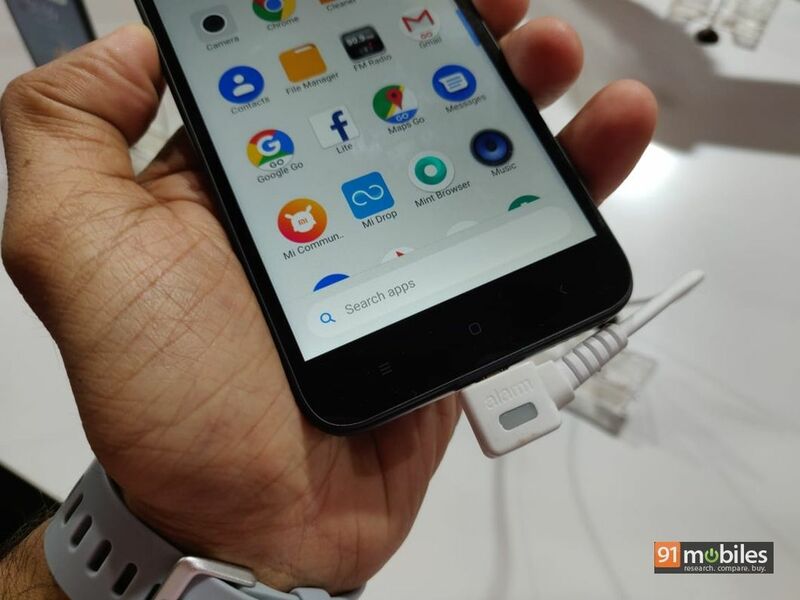 What’s more, Xiaomi has also made provisions for buyers who want to install a ton of apps on the Redmi Go as the device lets users port the data from various apps to the microSD card, thereby clearing up the phone’s built-in memory. Since the Redmi Go is an Android Go device, buyers should be able to get away with just a gig of RAM on the smartphone. 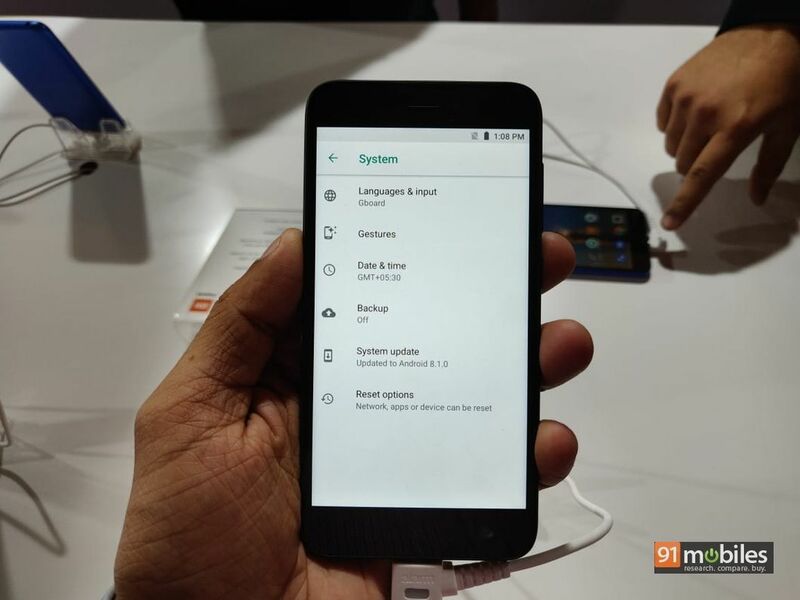 During my brief stint with the Redmi Go on the show floor, I didn’t come across any major issues with the handset’s performance. While the UI transitions felt a tad-bit jittery, the smartphone worked remarkably well for the most part. That said, I’ll talk more about the handset’s performance in my full review, so stay tuned. 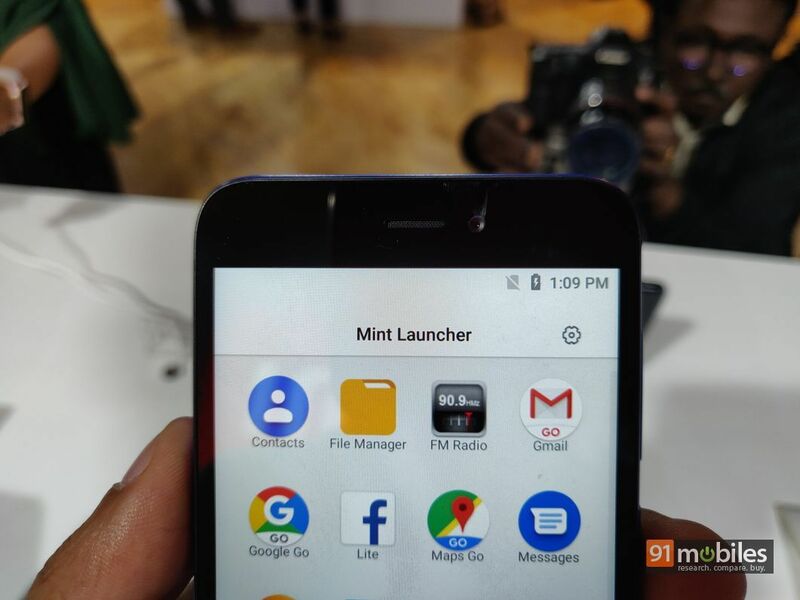 For software, the handset boots Android Oreo (Go Edition) and runs a custom launcher dubbed Mint launcher from the get-go. The launcher offers a fair bit of customization, such as the ability to change the icon pack and looks similar to the Google launcher found in the Pixel devices. As things stand, the company hasn’t disclosed if and when the smartphone will receive the Android Pie update so stay tuned for more information on the same. The Redmi Go is fueled by a 3,000mAh battery which coupled with the handset’s relatively low-res display, should last buyers a good while. That’s not all as the Redmi Go has been priced rather strategically at Rs 4,499, making it a great option for the entry-level buyers. 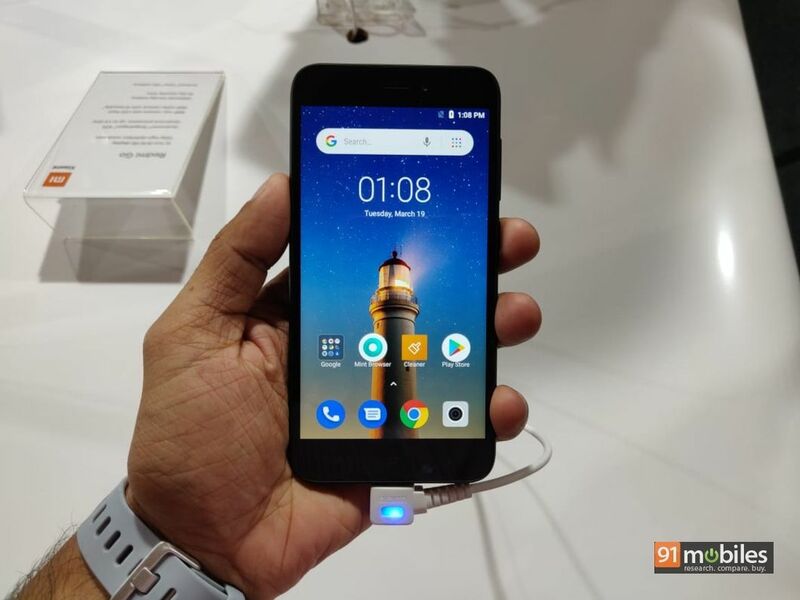 The handset will go on sale starting March 22nd and can be picked up from the company’s own website, along with Flipkart and various Mi Home stores. We’ll surely be putting the device through its paces to tell you whether it’s a worthy buy, so keep an eye out.